Chester Dee Bagwell was also known as Dee Bagwell.2 He was born on 5 November 1895 in Georgia.1,2 He was the son of James Harley Bagwell and Lula Virginia Findley.1,2 Chester Dee Bagwell married Maggie Gaines, daughter of (?) Gaines, on 12 June 1929 at Bartow County, Georgia.2 Chester Dee Bagwell died on 12 June 1978 at age 82.2 He was buried at Pine Log Cemetery, Rydal, Bartow County, Georgia. [S1129] United States Federal Census, Washington, District of Columbia, Population Schedule: Pine Log, Bartow, Georgia; Emuneration District: 6, Supervisor District: 7, Sheet: 11A, Dwelling: 176, Family Number: 176, Date: 1900. Thomas Buren Bagwell was also known as Buren Bagwell.2 He was born on 29 November 1898 in Georgia.1,2 He was the son of James Harley Bagwell and Lula Virginia Findley.1,2 Thomas Buren Bagwell married Mary Caroline (Carrie) Clark on 29 June 1927 at Jackson's Mill, West Virginia.2 Thomas Buren Bagwell died in July 1979 at age 80.2 He was buried at Georgetown Cemetery, Lewis County, West Virginia. [S1130] United States Federal Census, Washington, District of Columbia, Population Schedule: Pine Log, Bartow, Georgia; Emuneration District: 6, Supervisor District: 7, Sheet: 11A, Dwelling: 173, Family Number: 173, Date: 1900. Mary Elizabeth Bagwell was born in 1854 in Cartersville, Bartow County, Georgia.1 She was the daughter of Chester R. Bagwell and Sarah Ann Nabors.1 As of 1872,her married name was Barnes. Mary Elizabeth Bagwell married Martin M. Barnes in 1872 at Gilmer County, Georgia. Mary Elizabeth Bagwell died in September 1877 in Casssville, Bartow County, Georgia. [S4766] United States Federal Census, Washington, District of Columbia, Population Schedule: Subdivision 144, Bartow County, Georgia, Population Schedule: Subdivision 144, Bartow, Georgia; Page: 23, Dwelling: 178, Family Number: 178, Date: 1870. Nancy LuAnna Bagwell was born on 1 January 1862 in Georgia.1 She was the daughter of Chester R. Bagwell and Sarah Ann Nabors.1 As of 11 December 1879,her married name was Higgins. Nancy LuAnna Bagwell married Matterson C. "Mack" Higgins on 11 December 1879 at Bartow County, Georgia. Nancy LuAnna Bagwell died on 2 July 1930 at age 68. She was buried at Oaklawn Cemetery, Wynnewood, Garvin County, Oklahoma. [S1599] Email from William Terry Bagwell dated January 2011 to Hunter Wayne Bagwell; Subject Line: Euell Judson Bagwell Family. [S1500] Email from Joseph B. Bagwell dated September 2010 to Hunter Wayne Bagwell; Subject Line: Euell Stanford Bagwell Descendents. Randall Keith Bagwell is the son of Euell Stanford Bagwell and Louise Mathis.1 Randall Keith Bagwell married Valerie Ellen Blazon before 1990. Valerie Ellen Blazon married Randall Keith Bagwell, son of Euell Stanford Bagwell and Louise Mathis, before 1990. Estella Townsend was born circa 1887 in Georgia. As of circa 1903,her married name was Bagwell. She married Emory Judson Bagwell, son of John F. Bagwell and Mary Lou Bradford, on 15 November 1903. (an unknown value.) Estella Townsend and Emory Judson Bagwell lived in 1920 in Fairmount, Gordon County, Georgia. [S1600] Macile B Chapman Grave Stone, Find a Grave, www.findagrave.com. Fetney Elsie McMickin was also known as Elsie McMickin. She was born on 17 May 1900 in Franklin County, Alabama. She married Larkin Ellis Bagwell Jr., son of David Ellis "Doc" Bagwell and Selina Elizabeth Robinson, on 10 March 1921 at Alabama. As of 10 March 1921,her married name was Bagwell. Fetney Elsie McMickin died on 14 July 2000 in Mobile, Alabama, at age 100. She was buried at Pine Crest Cemetery, Molbile, Mobile County, Alabama. 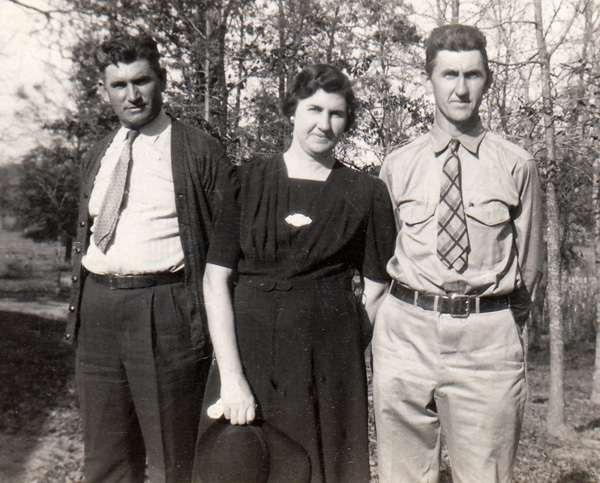 Children of Fetney Elsie McMickin and Larkin Ellis Bagwell Jr.
Larkin George Bagwell was born on 4 November 1927. He was the son of Larkin Ellis Bagwell Jr. and Fetney Elsie McMickin. Larkin George Bagwell died on 2 September 1994 in Mobile, Mobile County, Alabama, at age 66. He was buried at Pine Crest Cemetery, Molbile, Mobile County, Alabama. Virginia Dare Bagwell was born on 8 December 1923. She was the daughter of Larkin Ellis Bagwell Jr. and Fetney Elsie McMickin. Virginia Dare Bagwell married (?) Grosz after 1939. As of after 1939,her married name was Grosz. Virginia Dare Bagwell died on 25 July 1999 at age 75. She was buried at Pine Crest Cemetery, Molbile, Mobile County, Alabama. (?) Grosz married Virginia Dare Bagwell, daughter of Larkin Ellis Bagwell Jr. and Fetney Elsie McMickin, after 1939. Morris E. Bagwell is the daughter of Larkin Ellis Bagwell Jr. and Fetney Elsie McMickin. Ernest Raymond McCullouch was born on 10 June 1927. He was the son of Samuel Burress McCullouch and Fannie Mae Bagwell. Ernest Raymond McCullouch died on 15 March 1992 at age 64. William "Billy" Hrabe was born on 29 May 1879 in Cuba, Kansas.1 He served as the first band director of Sidney Lanier High School, Montgomery, Alabama, from 1923 to 1938. Director of the Masonic Home Band, the Shrine Band the West Point Railroad Band and the D.O.K.K. Band. Mr. Hrabe' was inducted in the Phi Beta Mu Bandmasters Hall of Fame in 1976. Source: Alabama Music Hall of Fame. 1929 Montgomery Alabama SIDNEY LANIER HIGH SCHOOL Pep Song by Billy Hrabe.1 He married Myrtle Ruth Hall, daughter of Frank Leslie Hall and Mattie Cordelia Goff, in June 1925. William "Billy" Hrabe died on 8 February 1938 in Montgomery, Montgomery County, Alabama, at age 58. [S2265] Email from Wayne Parker Bagwell dated July 2012 to Hunter Wayne Bagwell; Subject Line: Aunt Mattie Goff Hall / Ruth Hall Hrabe Price. Edgar Price married Myrtle Ruth Hall, daughter of Frank Leslie Hall and Mattie Cordelia Goff, after 1939. Charles William Feeney is the son of Malachia Francis Feeney and Theresa Minerva Koerner. Charles William Feeney married Karen Anne Beckerich, daughter of Donald R. Beckerich and Joyce Marilyn Abrams, on 6 August 1983 at Immaculate Heart of Mary Catholic Church, Indianapolis, Marion County, Indiana. Donald Francis Feeney is the son of Charles William Feeney and Karen Anne Beckerich. Karen Anne Beckerich is the daughter of Donald R. Beckerich and Joyce Marilyn Abrams. Karen Anne Beckerich married Charles William Feeney, son of Malachia Francis Feeney and Theresa Minerva Koerner, on 6 August 1983 at Immaculate Heart of Mary Catholic Church, Indianapolis, Marion County, Indiana. Charles Joseph Feeney is the son of Charles William Feeney and Karen Anne Beckerich. Bridget Anne Feeney is the daughter of Charles William Feeney and Karen Anne Beckerich.